Alexandria Ocasio-Cortez vs. the establishment: Which one has the real problem with truth? It’s hilarious how right-wing pundits and their social media universe react hysterically to almost everything that newly-elected Rep. Alexandria Ocasio-Cortez, D-N.Y., says, does or dances. But what’s much more serious — and even downright dangerous — is the way the so-called serious center, typified by fact-checkers, seem similarly unable to grasp what she’s up to, even when she uses very small words. “Rep. Alexandria Ocasio-Cortez (D-NY) is fine with being called a ‘radical,’ believes President Donald Trump is racist, and is okay with sometimes fudging facts as long as she is ‘morally right.’” That’s how Vox described “key moments” from her interview. Apparently, Vox is OK with sometimes fudging facts, because that’s not what Ocasio-Cortez said. In fact, it’s the opposite: She called it “completely necessary” to get facts right. 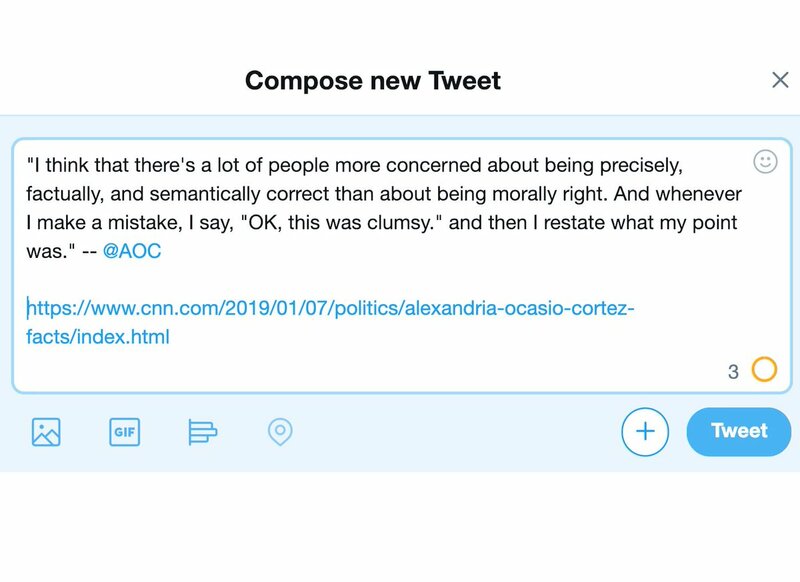 But a lot of folks — CNN’s Chris Cillizza, for example — seem strongly invested in pretending otherwise, because Ocasio-Cortez dared to make the added point that being morally correct was more important to the core purpose of public discourse. We’ll return to Cillizza below, but first we should note that Nobel Prize-winning economist Paul Krugman gave Ocasio-Cortez four “anti-Pinocchios,” as it were, for the most newsmaking aspect of the interview: her argument for a 70 percent marginal income tax rate on incomes over $10 million. It’s taken seven-plus years and a Democratic wave election to finally get some common sense economics back into the national conversation — in this case tax policy, though that’s only one part of the picture. As Krugman explains, the Diamond-Saez analysis rests on two core economic propositions: Diminishing marginal utility (meaning that an extra dollar means a lot more to low-income than high-income people) and competitive markets (meaning that everyone gets paid according to what they contribute to the economy). In short, there’s no empirical support for GOP trickle-down orthodoxy, and plenty of support for Ocasio-Cortez’s advocacy of much higher top tax rates. It is quite astonishing the degree to which the United States today [1991!] is, in respect of its state finances and its elites’ attitudes, following the path that led early modern states to crises. As in the past, inability to sustain international influence is merely symptomatic of deeper internal decay. For example, lack of consensus among U.S. elites has virtually immobilized efforts to deal with a persistent federal budget deficit, and has hamstrung state action in many foreign policy theaters and in much domestic policy planning. The only consensus that has prevailed in the last decade is precisely that which history tells us is the most disastrous, namely, the consensus that private consumption should take precedence over all public expenses, and that raising taxes to realistic levels to meet state obligations should be fiercely resisted. Hence the U.S. government has been running a growing debt, sustained only by foreign borrowing. So the wrong-headed GOP chorus of 2019 is not an isolated historical phenomenon. It’s an integral part of the systemic dysfunction that has befallen America over the past 50 years, and just the latest example of a recurrent phenomenon that has been documented in multiple other historical examples across the millennia and around the globe. The history of how such instability and dysfunction grows is much more clear-cut than the question of how it can be remedied or resolved. That’s especially true given that we’re the first people in history to actually have some idea of the process we’re in the middle of — if we care to examine what has been learned about it in recent years. One thing is certain: The lessons conclusively show that much of today’s conventional wisdom — not just about taxes, but many other things as well — is completely wrong. The more diligently we follow it, the more certainly we seal our doom. Cillizza responded by claiming he hadn’t had enough space.
.@CillizzaCNN – looks like your ‘character count’ argument to avoid including my full quote is straight up wrong. Ocasio-Cortez’s point about the GOP’s blatant tax-rate lies is worth an article all by itself. But worse than Cillizza’s phony “character count” argument was his admission that he included her full quote in his story — and then ignored it in his own analysis! In days of old, men simply didn’t listen to women. Now they listen, and even transcribe, but simply do not hear.Cillizza scolds Ocasio-Cortez by saying: “Here’s the thing: Being factually accurate and morally right isn’t an either/or situation. You can do both!” As the transcript of her interview with Cooper makes clear, that was exactly the point she had made. Ocasio-Cortez didn’t say it was a question of either/or. She said it was a question of priority, of prioritizing the important moral argument you’re trying to make. Failure to grasp that simple fact has been liberals’ problem since the birth of Enlightenment reason, as George Lakoff has argued since his 1996 book “Moral Politics,” which I reviewed for the Christian Science Monitor at the time. Lakoff’s 2004 book “Don’t Think of an Elephant! : Know Your Values and Frame the Debate” was directly aimed at activists and became a bestseller, but still didn’t seem to penetrate at the highest levels of political leadership, where it matters most. Until now. Ocasio-Cortez knows better, and she has shown that over and over again. Her point about the primacy of moral rightness cannot be emphasized strongly enough, and is in no sense opposed to making sure you get the facts and figures right. That brings to mind the famous phrase “budgets are moral documents,” which has long been associated with Martin Luther King Jr., although there's no documentation that ever said it. We do know that King said this: “A nation that continues year after year to spend more money on military defense than on programs of social uplift is approaching spiritual death.” That was from his epochal prophetic sermon, “Beyond Vietnam,” and the sad fact is that 52 years later we have not yet gotten past the mistakes that led us into Vietnam and the lessons we ought to have learned there.